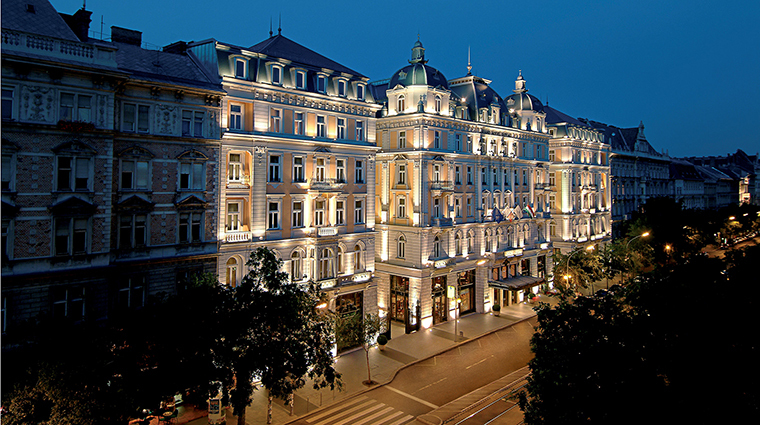 Set on the Grand Boulevard at the pulsing heart of the Hungarian capital, Corinthia Hotel Budapest blends the old and the new flawlessly. The original Neoclassical façade left over the historic 19th-century hotel merges nicely with the renovated rooms, suites and halls. While only the front of the hotel, its gilded ballroom and spa are original to the 1896 building, the new parts of the hotel integrate to evoke the historic feel of the belle époque combined with modern luxury. In the marble-filled lobby, a placard hangs on the wall, listing the names of all Corinthia Hotel Budapest’s most illustrious residents. The hotel itself encompasses a vast labyrinth leading to grand suites, a spa featuring ESPA treatments, several great restaurants and state-of-the-art business and events facilities (the largest hotel conference space in the city). 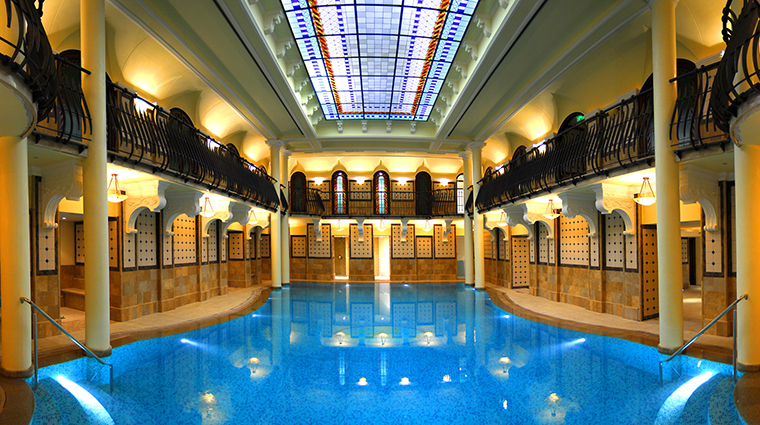 • Go to the fully restored 19th-century Royal Spa for the pool. The setting is beautiful: Swim under the stained-glass ceiling surrounded by Corinthian columns in the nearly 50-foot-long pool. • Transport yourself back in time in the historic ballroom adorned with gold leaf and gilded mirrors. In the early 20th century, it also functioned as a cinema. • Among the dining options, Brasserie and Atrium is a good choice for a fine-dining atmosphere and farm-fresh dishes, and Bock Bistro for a more casual vibe with Hungarian tapas. • Its central location makes it great base to explore the city, being close to Andrássy Avenue and the historic Jewish Quarter. • Even though the Royal Spa has its main entrance away from the hotel, you can still access the art deco spa via an exclusive lift that connects the directly with the Budapest hotel. • There are a couple of hidden rooftop gardens in the hotel premises, one lies in the middle of the Corinthia Apartments complex, and the other is on top of the ballroom. 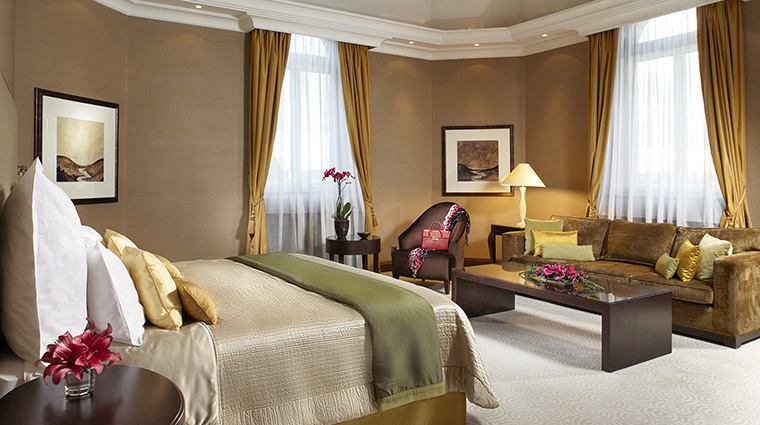 • If you’re staying at the hotel, you receive free entry to Corinthia’s Orfeum Club, a cabaret and music venue. • The presidential suite, named the Liszt Ferenc Suite after the Hungarian composer, takes up the entire top of the façade. 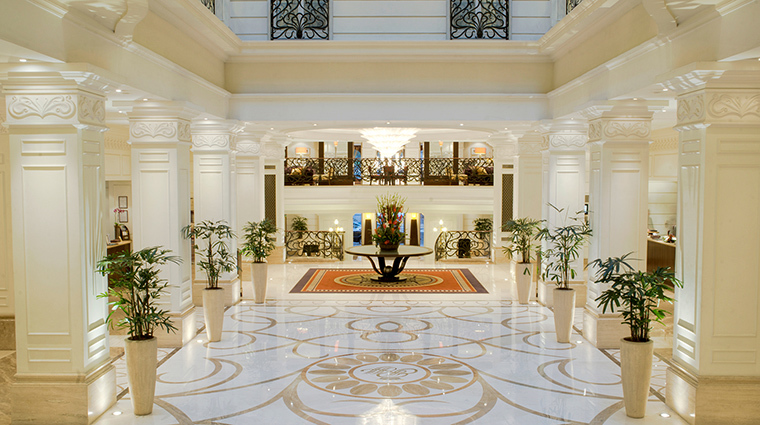 Stretching out over 2,583 square feet, it is Hungary’s largest hotel suite. • The hotel’s Executive Suites were designed by Goddard Littlefair (which also did the interiors for Corinthia Hotel St Petersburg). 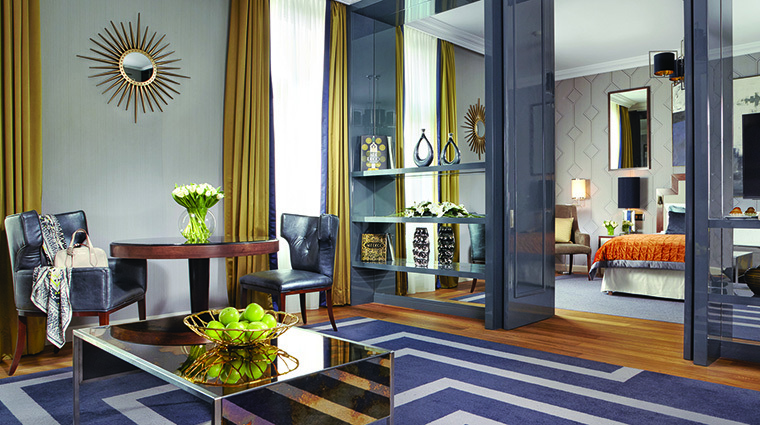 The suites have a contemporary accent in neutral tones of taupes and light gray. • Suite and Executive King Room guests receive access the Executive Lounge, which has private check-in and checkout, a library, business center facilities, a TV room and daily snacks. • Longer-term guest should check out the 26 Royal Residences, each of which comes with its own kitchen, living room, dining room and washing facilities. • Set under the spectacular atrium, Brasserie and Atrium restaurant specializes in an artisanal-farm-to-table concept. So expect fresh local produce, meats and dairy in every dish. Here you’ll find the hotel’s Sunrise Breakfast, a buffet offering everything from seafood to pastries. • Rickshaw Restaurant takes you on a journey to the Far East with its traditional Asian flavors paired with the freshest ingredients. Taste everything from dim sum to Peking duck. • A standout among the dining options is Bock Bistro, which serves a curious fusion of Hungarian flavors and Spanish tapas. Don’t miss the great wine list and live accordion music in the evening. • Journey back into the 19th-century cabarets in the Orfeum Club, which hosts regular shows with the best acts in the city. • With Caviar & Bull set to open in early 2017, the luxury hotel will add another gastronomical hub to its oeuvre, bringing the taste of Malta to the city.